Customers of Bentley Birmingham and Rudells enjoyed a night of glitz and glamour when the dealership invited them to a special jewellery evening. The showroom was almost emptied of cars, with just a selected few Bentleys left for those visitors who wanted to peruse the latest models between checking out some spectacular diamonds and dynamic watches. 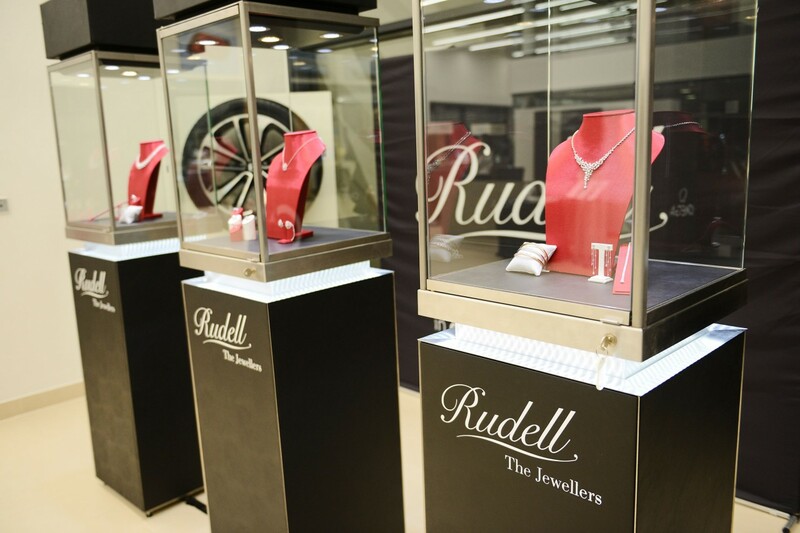 The event was organised by Rudell the Jewellers, a company which has showrooms in Harborne, Birmingham and Wolverhampton. There were around 200 people present and it was a very relaxed social evening with some fabulous jewellery and some very nice Breitling watches on display. Showcase Hire was delighted to be apart of this exclusive event with Rudells and Bentley. Rudells used our finest showcases which included The Spectrum, The Rigel and our Strata counters. The show required 46 of our unique showcases, this was no problem for The Showcase Hire team. Perfectly organizing the logistics for the show so it was a smooth operation for our clients. We pride ourselves on excellent service and providing the best product on the market. Our clients were extremely happy with Showcase Hire and gave us some amazing feedback. ” I would like to take this opportunity to thank you all very much indeed for your professionalism and efficiency and should we need to hire any cabinets in the future, then i will ensure that we contact you”.